Now that Batman’s fried and shriveled with only one chapter left in Final Crisis, it’s time to take a look at the theory that Batman will become the new Spectre and see how it’s holding up. 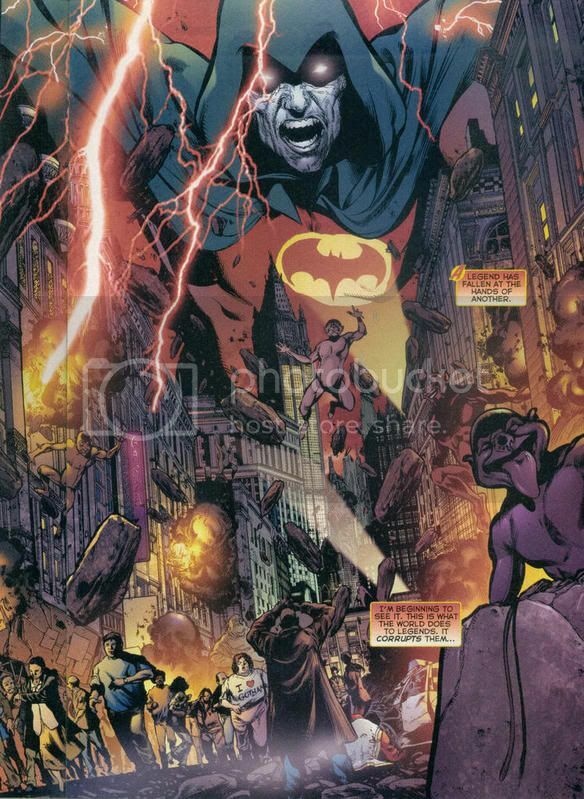 • Killing Batman in the penultimate chapter has the power of building the drama before the resolution, but it also leaves the door open for a return in some capacity in the final book. • Final Crisis: Revelations has essentially been a drawn-out way of removing the Spectre from his human host. Final Crisis #6 noted that the mystics are attempting to contact the Spectre, presumably to draw him in to the final battle. • We still have yet to really get a conclusive answer on who betrayed Batman. Given the mantle of the Spectre is regarded as a curse, perhaps assignment to that role is seen by Bruce as a betrayal by God. God was definitely known to readers since the beginning of Batman. • Crisis on Infinite Earths #11 establishes that The Spectre has the power to save the multiverse. In Justice League of America #47 from September of 1966, The Spectre was called upon to keep Earths 1 and 2 from colliding, providing essentially a multiversal bridge between the two. So there is a precedent for the Spectre saving the day in multiverse-threatening situations. Such a clear escape clause would only seem needlessly muddled by a stint as The Spectre. • There’s also a slight possibility that that wasn’t actually Batman. The Flashes said they would have to stop Darkseid. Batman dropped his gun vow. And when Darkseid asked Batman if he could “outrace” the Omega Sanction, Batman said “Try me.” He seemed confident in his ability to be faster. Could that have been one of the Flashes in disguise? Superman? Or even the Black Racer, which the Flashes were leading to Darkseid? If so, why the disguise? There just seemed to be hints about Batman having no doubt that he was fast enough, and there would be some nice irony involved with placing that scene immediately after the Flash scene, if the Flashes were in fact suggesting they needed to go back in time to set up that situation. Note that the Omega beams are purple as they’re fired, but when Batman is hit, it’s all red and yellow. Then at the same time, Batman was in the Evil Factory because Darkseid’s gang was trying to clone him. Maybe one of the clones worked? And Batman’s memories were enough to make it a good guy? Regardless, if he isn’t really dead, then there’s no need for an afterlife, and thus no Spectre in his future.